"So this is how life goes, Your Eminence. You should really be the one sitting here." 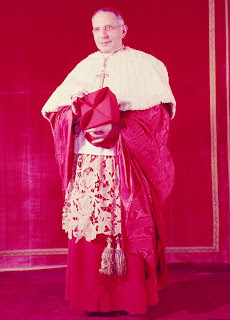 Cardinal Lercaro and then-Cardinal Giovanni Montini had been front-runners on the earliest ballots in the 1963 conclave to replace Pope John XXIII. Reports suggest that, eventually, the Cardinal-electors considered Cardinal Lercaro too "radical" to elect; he was famous for having turned his Cardinal's palace in Bologna into an orphanage. Cardinal Lercaro, who had also received votes in the 1958 Conclave, was among the first members of the post-World War II hierarchy to preach a "Church of the poor" -- an ecclesiology that was to be developed further in Latin America, in some questionable directions -- during the 1970's. In fact, during his tenure as Archbishop, he had tried to begin dialogue with members of the Italian Communist Party, which was the most popular political party in Bologna. Now, fifty years later, a Conclave of Cardinals has selected a Latin American Cardinal, Jorge Mario Bergoglio -- who lives in a humble apartment, cooks his own meals and rides the public bus system in Buenos Aires -- as the new Supreme Pastor of the Catholic Church. Just as in 1963, the Conclave fifty years later had candidates who might have been considered more cultured, more learned, more photogenic or media-savy than Francis. And, just as it did in 1963, the 2013 Conclave could have turned to "safer" candidates. And while the prayerful expectation is that Pope Francis will be a Pope of continuity, he has perhaps a unique opportunity for reform - a reform no doubt strongly supported by many of his Cardinal electors. Not since 1963, or even within the last century or more, has the call for reform been so universal. And there is at least one more historical confluence across five decades: that -- in effect -- Benedict has said to Francis: "You should now be the one sitting" in the Chair of Peter.